It has been an exceptionally busy year for the gallery and our big centenary exhibition, William Scott and Friends, was the highlight of the summer. We have however been adding to our inventory throughout the year and now have an excellent collection of new acquisitions for this exhibition. 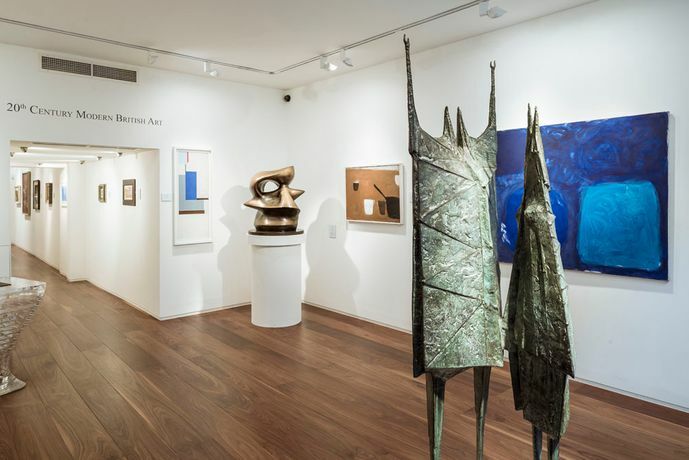 We are well known for our collection of works by Henry Moore and Lynn Chadwick and some of you will have visited the Abbot Hall Gallery in Kendal for the wonderful Lynn Chadwick exhibition we helped arrange this summer. In this collection we include the life size High Wind by Chadwick and the large Spindle Piece by Moore. In addition we have an exceptional early elm wood construction by Robert Adams, two important early bronzes by Kenneth Armitage, a Frink Eagle and a monumental William Turnbull. We introduce the Boyle Family for the first time. Boyle Family, a group of collaborative artists, have been documenting and recreating the surface of the earth, a project that has lasted decades. The sites are chosen randomly but are recorded very precisely, recreating and representing familiar landscapes without distortion or allusion. Highlights of paintings in this year's Modern British exhibition include a very early large study by John Craxton which is almost abstract in appearance, a Reynolds of huge proportion unearthed from a private collection where it had been since the late 1950s, two lovely Pasmore paintings, similarly held in private hands since they were made, an important William Scott, and a Christopher Nevinson from 1919 of World War I. We have also included key linocuts from the major artists from the Grosvenor School of Art  Andrews, Flight and Power  reflecting their status both here and internationally.